Tag line: "THE SOMETIMES VIOLENT STORY OF A DRIFTIN' COWHAND!" Trivia: Very loosely inspired by William Shakespeare's "Othello"
Delmer Daves certainly wasn’t the most recognizable filmmaker to emerge from Hollywood’s Golden Age, and I’m sure there are plenty of people out there (myself included) who aren't familiar with his work. As a writer, he penned the script for the classic The Petrified Forest, as well as the Busby Berkeley musical Dames; and when he first tried his hand at directing, he made films like Destination Tokyo and Dark Passage (one of four pictures to feature both Humphrey Bogart and Lauren Bacall), just to name a few. After signing with 20th Century Fox in 1950, Daves jumped head-first into the western genre, turning out 3:10 to Yuma (1957) and Cowboy (1958), both of which are still held in high regard. 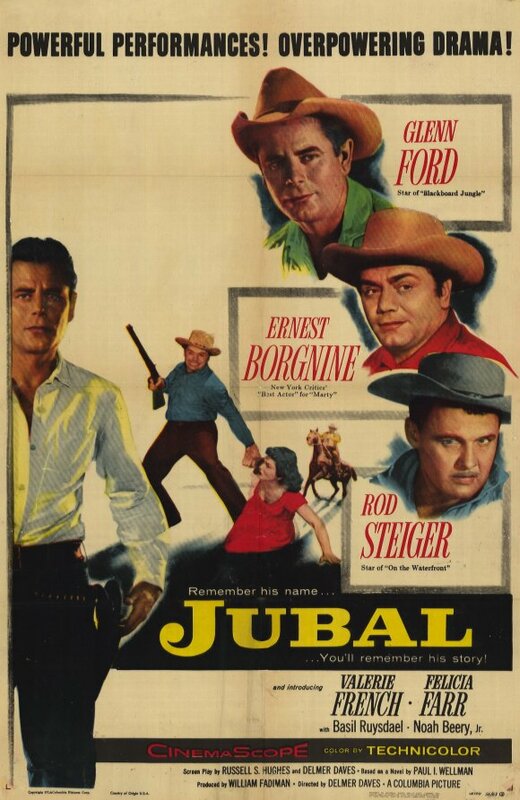 Before today, I had never seen Jubal, his 1956 picture starring Glenn Ford, Ernest Borgnine, and Rod Steiger. Now that I have, I can't wait to check out some of the director's other movies! While making his rounds, rancher Shep Horgan (Ernest Borgnine) comes across an unconscious man lying in the middle of the road. As Shep soon discovers, the man’s name is Jubal Troop (Glenn Ford), a sheep herder who claims he's also a pretty good cowboy. In need of extra help, Shep hires Jubal, and some time later even names him his new foreman, much to the chagrin of Pinky (Rod Steiger), a longtime employee of Shep's who wanted that job. Unfortunately for Jubal, he also catches the eye of Shep’s flirtatious wife, Mae (Valerie French). Out of respect for Shep, Jubal refuses to get involved with Mae, and instead turns his attentions towards Naomi (Felicia Farr), the daughter of a religious leader who, along with a group of others, is heading west, looking for a place to call their own. Yet, try as he might to avoid her, Mae continues to pursue Jubal, which doesn’t sit well with Pinky (who, apparently, had a “relationship” of his own with Mae years earlier). Though anxious to discredit Jubal, Pinky decides not to tell Shep about what’s been going on behind his back. But will he stay quiet forever? First and foremost, Jubal is a beautiful motion picture; right out of the gate, Daves wows us with spectacular panoramas (it was filmed on-location in Wyoming), and there are many instances throughout the movie where he utilizes wide shots to show off the extraordinary backdrop. But, of course, there’s more to Jubal than just pretty scenery, which we discover once the characters are introduced. 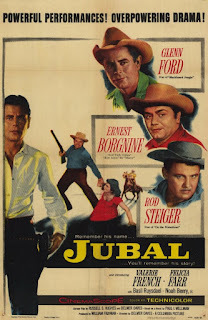 Glenn Ford delivers an outstanding performance as Jubal, who, despite the mystery surrounding him (where did he come from? Is he running from somebody? ), is, at all times, an upstanding guy. Equally as good are Ernest Borgnine as the friendly yet naïve Shep, who is better at handling his employees than he is his own wife; and Rod Steiger as the ornery Pinky, who doesn’t like anyone or anything (he and Jubal remain at odds through much of the movie). Each of these actors, plus the supporting cast (also worth noting is Valerie French as the bored housewife looking for some excitement), keep Jubal interesting, and while the story itself isn’t exactly new (it was loosely based on Shakespeare's Othello), the strong characters, as well as Daves’ keen eye for visuals, do their part to make it all seem fresh. Compared to filmmakers like Howard Hawks, George Stevens, John Ford, and even Anthony Mann, Delmer Daves seems to have been something of a hidden gem. But if Jubal is any indication, he clearly had the talent and ability to shine just as brightly as his contemporaries.